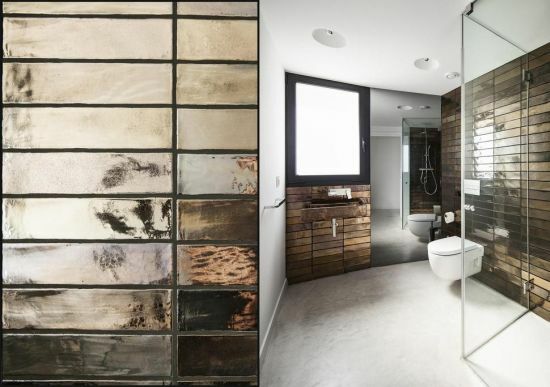 Here are the top 35 modern bathroom ideas for all of you that want to have spacious and cleaner looking bathrooms, the designs of which vary from simple textured walls, to using geometric shapes, to utilizing minimalist furnishings, to choosing mid century accents, and picking sophisticated color patterns. 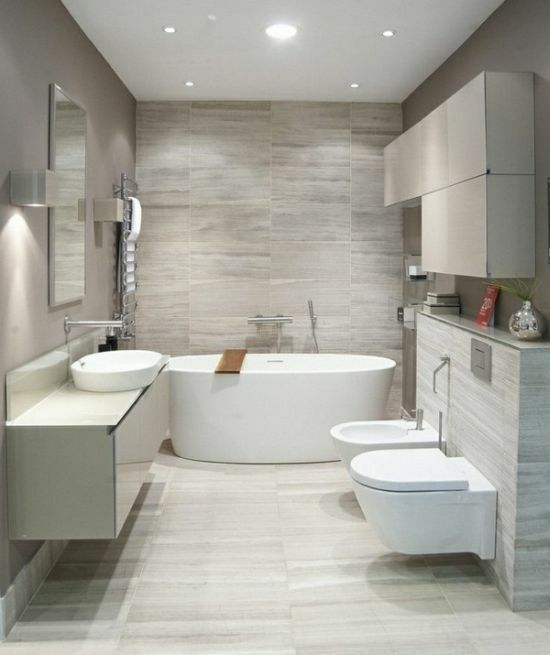 Incorporating all of these elements will guarantee you of a spacious bath area that will look elegant and will make your bathing a pleasing ritual. 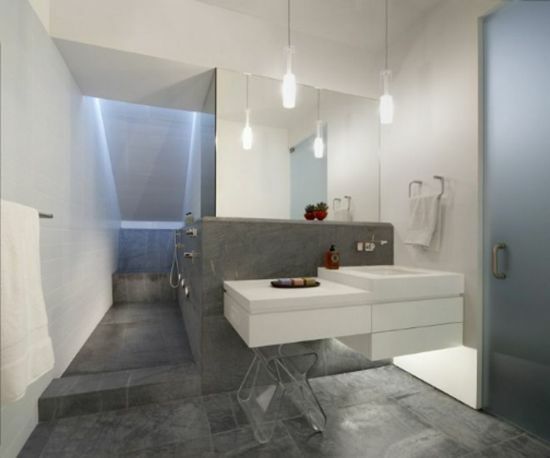 A modern bathroom mustn’t only be designed, keeping beauty and style in mind, but must also allow users to utilize it in more than one way, i.e, it must be functional. Fine detailing has to be done if you want your bathing area to be addressed as modern. 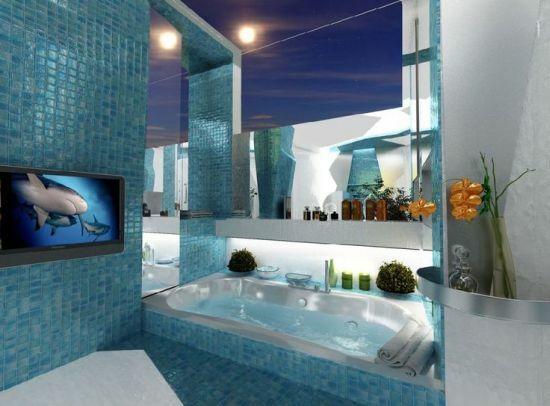 Let’s scroll down and give our eyes a relaxing time by looking at some of the most stunning and creative modern bathroom decorating ideas! Mid century design ideas typically relate to those that were prevalent during the era of the 30’s and lasted till the 60’s. So, any design or decor idea that was used or incorporated after the World War I ended is termed as mid century. A mid century modern bathroom will be adorned with minimal color scheme, a clean vanity area that’s stylish, yet lacks an ‘over the top’ look, geometrical patterns on walls and floors, and lots of simple straight detailing everywhere. The decor of these bathrooms is simple in looks, and the wall decor is basic, sometimes absent, only to retain the feel of spaciousness. Furniture arranged in such bathrooms generally looks compact. 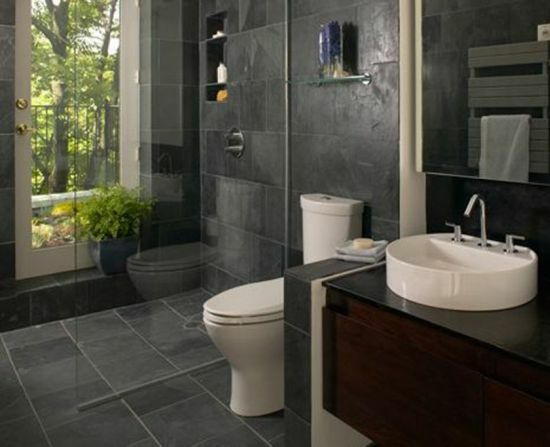 Black, white, grey and neutral color schemes work very well for mid century bathrooms in contemporary style. If you are getting a little confused, let us show you a cool line up of beautifully designed modern bathrooms bearing architectural details that were used during the olden times. See and enjoy! When you are renovating your old bathroom to look modern and stylish, the first thing that you gotta do is focus on every detail as simply as possible. 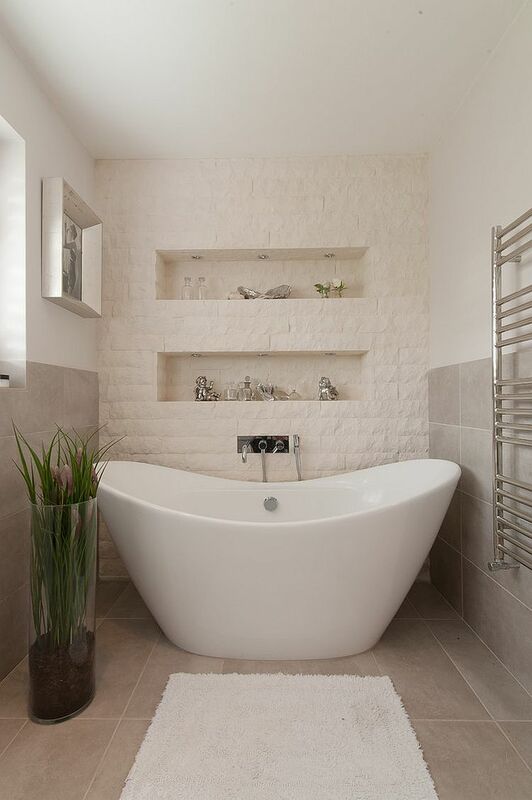 Yes, being simple is the mantra to creating a modern bath area. 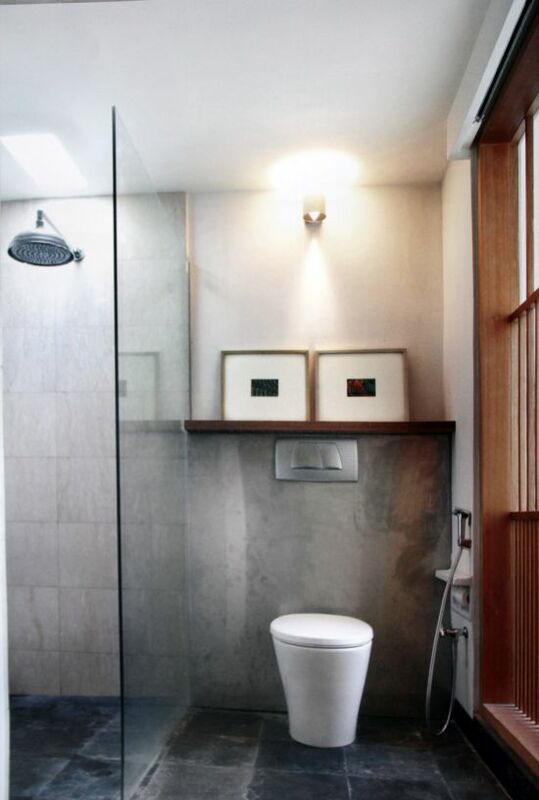 However, simple doesn’t mean you have to deprive your bathroom of basic amenities and stylishness. The main idea here is to create an intimate space that’s clutter free and looks like an area where you can breathe freely. For incorporating simple and minimalist decor ideas, you would have to consider hiring a designer who will be the best to judge whether your bathing chamber needs furniture or it can do with open shelves or cabinets to store things. 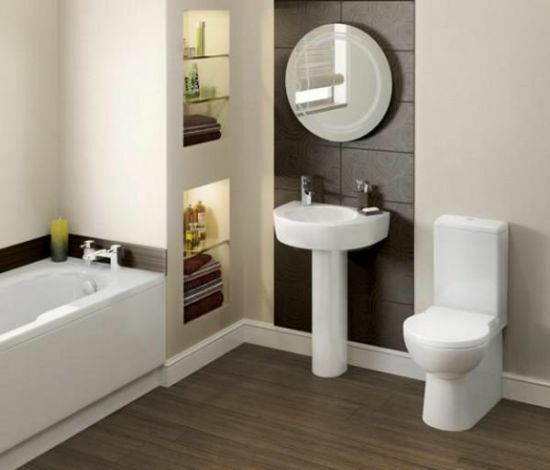 The below showcased simple modern bathroom designs are spacious and have proper storage solutions. 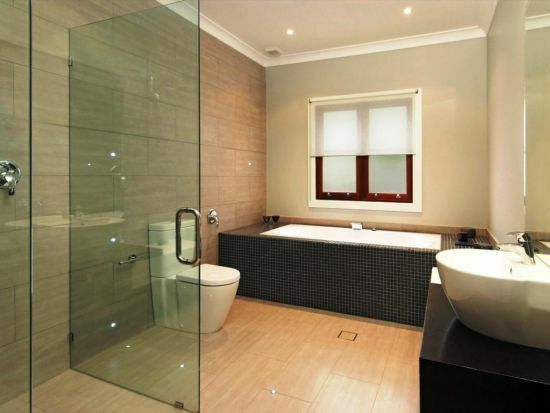 Also, these bathrooms look sophisticated without using heavy furnishings and designs. For a simpler or minimal look, try going for geometric patterns on walls, or in the back splash area. Choose neutral colors that match perfectly with the flooring, and add a painting or two on the wall to enhance the stylishness. 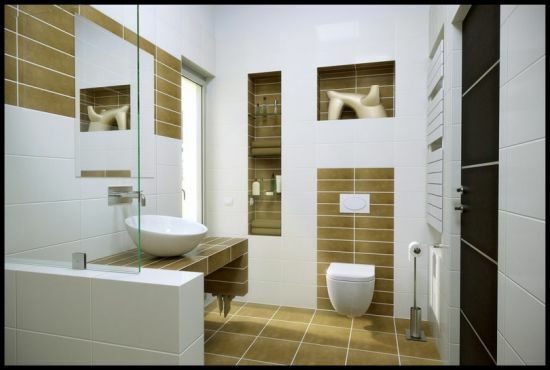 Your bathrooms can bear modern and stylish look when you add geometric accents to them, either on the wall or in floors. 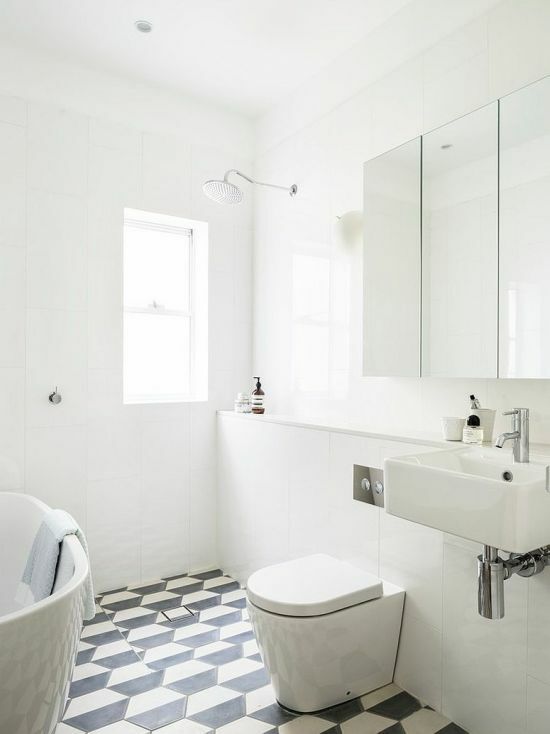 A modern themed bathroom will bear neutral color scheme and accents that are more towards geometrical shapes like triangles, squares, ovals, roundels or hexagons. 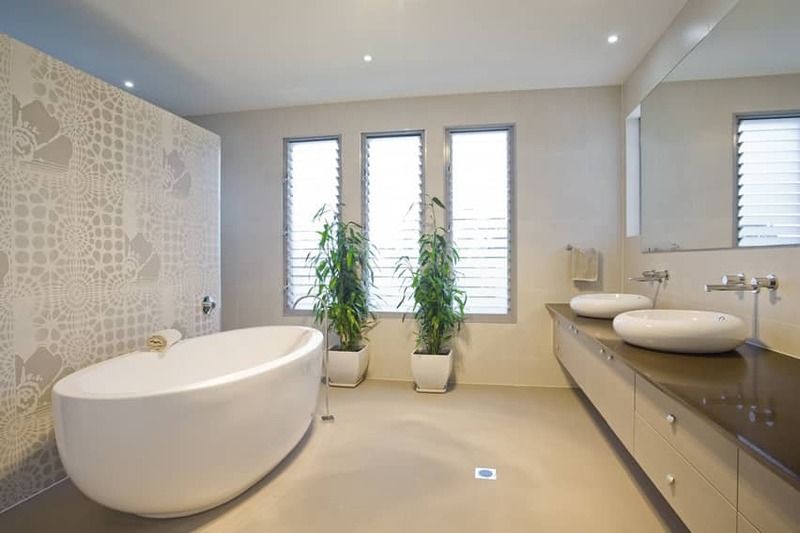 The modern bathroom decorating ideas of these times need homeowners to consult various professionals that offer apt decor solutions to lend bathrooms a unique look. 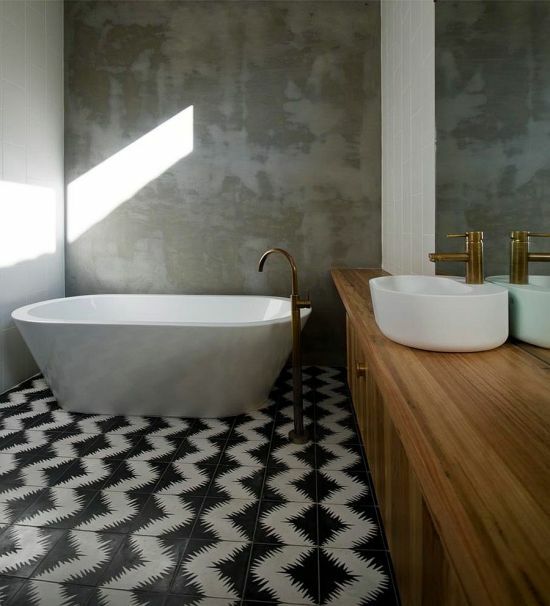 Most stores dealing with bathroom furnishings will offer you hundreds of cool and creative geometric styled tiles and wall patterns that lend a touch of spaciousness to the interiors. Geometric designs on floors and walls create a fashionable look without appearing too garish or loud. Also, these designs make bathrooms appear designer hubs without stacking accessories here and there. Choosing grey accented walls with geometric patterns works well for minimal styled bathrooms, but if you want to have a little flamboyant looking space, go for black and white that’s always a popular choice. 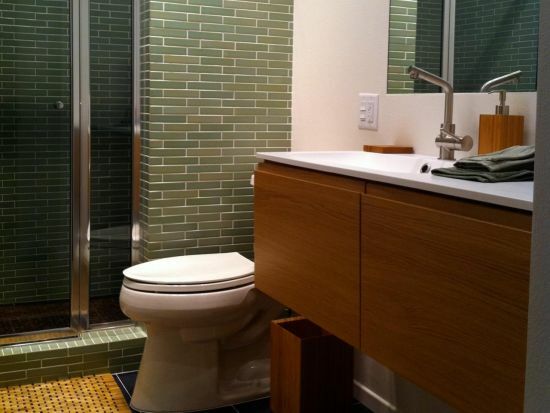 Going organic and green is the new thumb of rule when you are remodeling your bathroom on modern lines. Organic accents can be added to your bathing area in a number of ways to bring the nature come alive inside, like, arranging potted plants at nooks or corners, or keeping a fresh planter with seasonal flowers on top of your sink, or adding green accents to your walls and flooring. Modern design ideas thrive freely when combined with green detailing. For a serene look inside your bathroom, try placing lots of small glass vases over your cabinets and opt for large windows that let you enjoy the outdoors too. 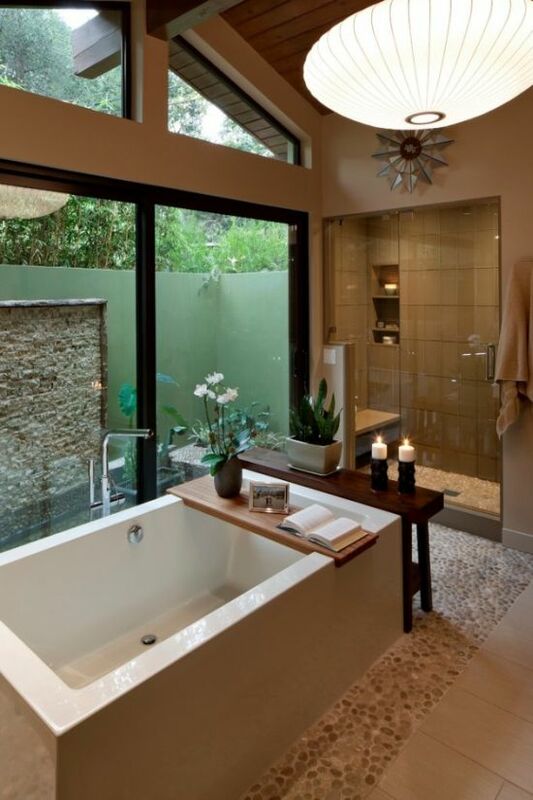 For you to understand the true meaning of greenery, we have showcased below a few stunning modern bathroom ideas where the users have gone green in the literal sense of the term! 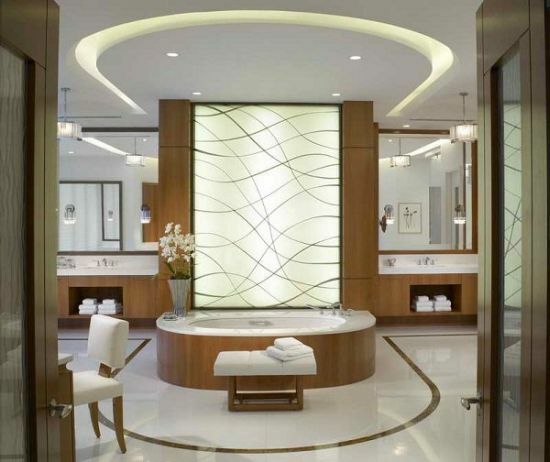 Lighting plays an integral party in lending true class and personality to any room, specially a bathing area. It cannot be ignored when considering using modern bathroom remodel ideas to renovate your old bathroom as the very core and essence of it depends largely on light fixtures. There is no limitation when choosing light fixtures for your modern styled bathrooms as the market is always flooded with hundreds of designs and styles. But, the main issue here is to pick such lighting options that lend a classy touch to your bathroom’s interiors and makes it look spacious. 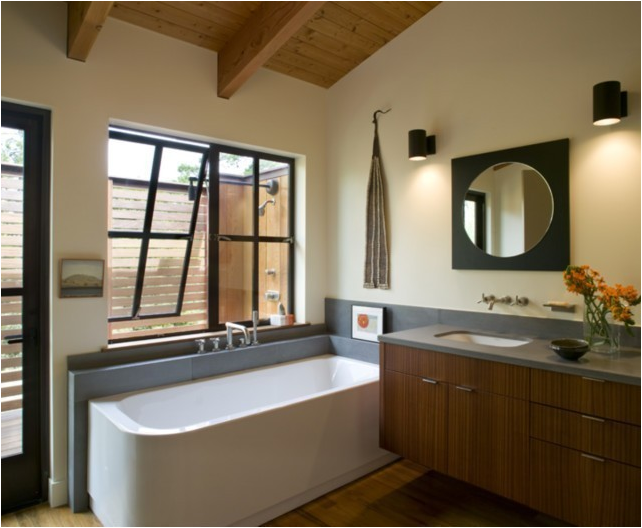 Since, modern bathrooms are styled on natural lines, its always better to go in for large windows and skylights to make the outdoors mesh seamlessly with indoors. 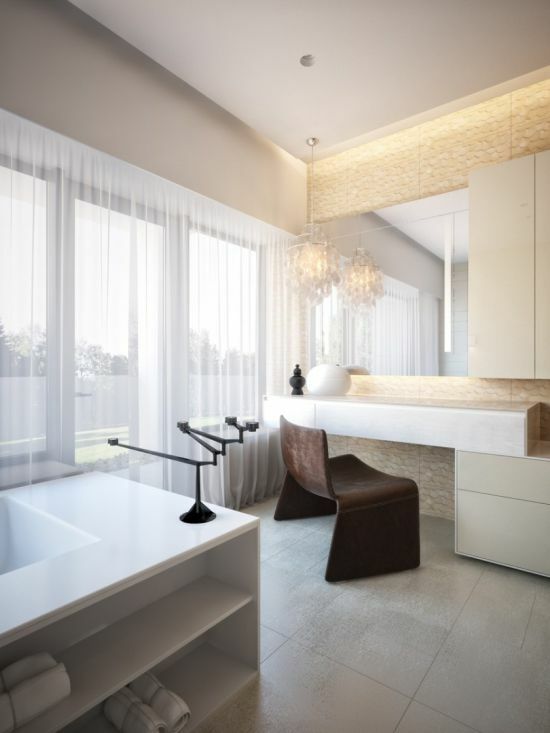 For a profound effect of light in your bathrooms, try choosing such lighting that will offer good quality light and will not create a suffocating feel. 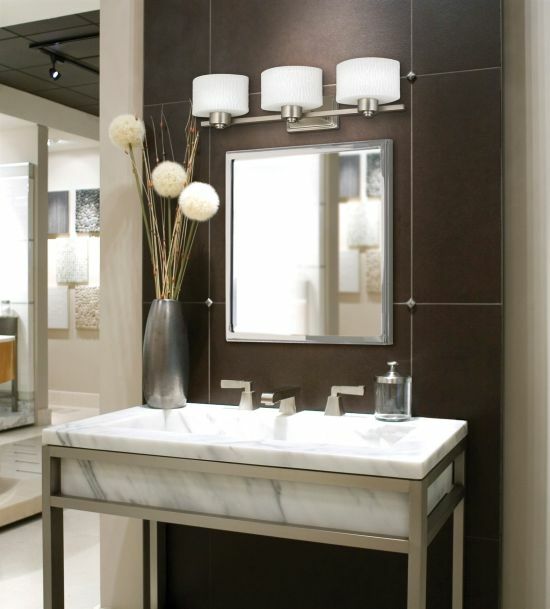 Now a days, many home owners are going for accent lighting in their bathrooms to create a stylish look. 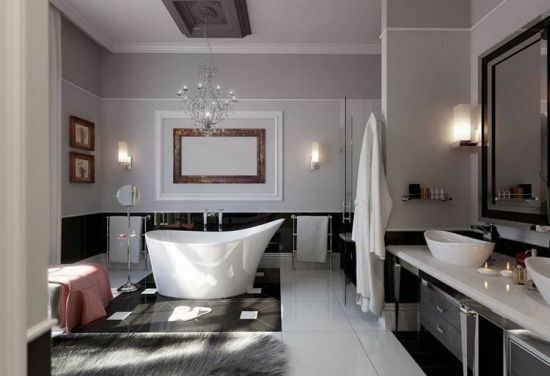 Chandeliers on top of a bathtub, or pendant light fixtures too are popular choices. For cabinet lighting, go in for under cabinet light fixtures for an illuminated effect. Most of modern bathroom designs incorporate the use of freestanding bathtubs in various styles. 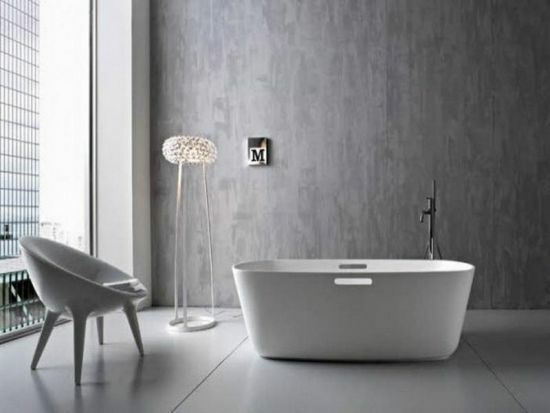 If you refer any decor magazine, you will surely come across modern bathing rooms that are furnished with smart looking freestanding bathtubs that are regarded as one of the most essential elements to getting a trendy look inside your bathroom. A freestanding bathtub can be moved from one place to another as its not fixed to your wall or unit. But, before you place it, make sure you have the right space marked up correctly in your mind as any wrong decision will mar the total effect it creates and will break the modern look of your interiors. 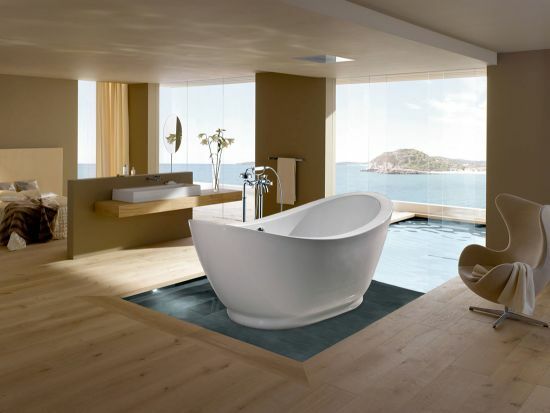 Always think of the balance a freestanding bathtub will create when its placed at a particular point in your bathroom. 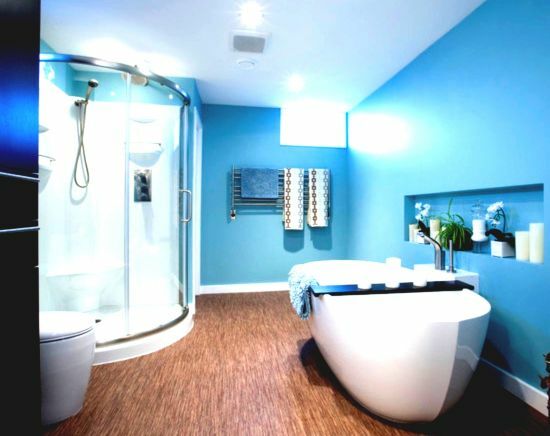 For example, do not just place your tub in the middle of your room and then place furnishings accordingly. There are different shapes to choose like roundel, oval, rectangular and also pedestal. When we talk of modern bathroom decorating ideas, we cannot ignore paint options available to us in hoards. Painting your walls with colors adds shine and style to any room, and your bathing chambers too are not left behind where coloring walls is concerned. For a modern take on decoration, go for such colors or paint options that lend a feel of a bigger space like blue, white, grey and ceramic brown. But, its not mandatory to paint your walls with light colors as there are many homeowners that have remodeled their old bathrooms with vibrant shades of paints like yellow, green, black, maroon and purple. 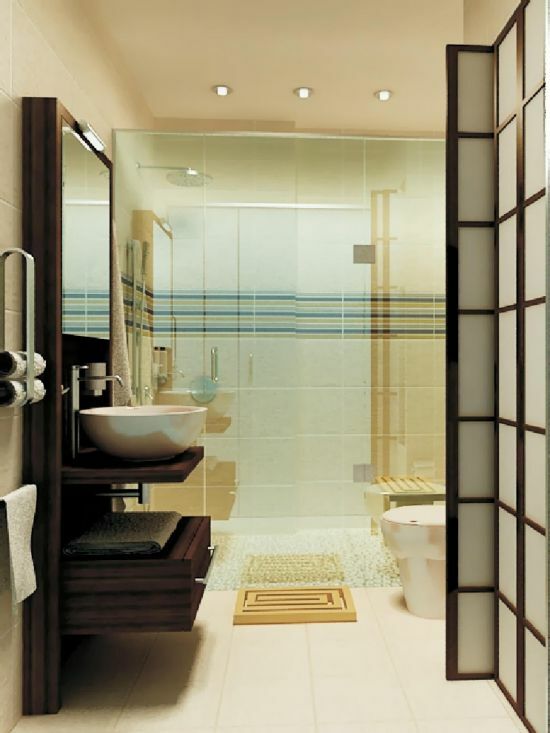 Whatever color pattern you choose, always try to maintain the harmony of elements inside your bath area. For you to have a closer look, we have rounded two very glamorous modern bathrooms with paints that will transform any plain interior in an instant! The modern bathroom ideas below will show you how reflective or mirror tiles can lend a feel of greater space inside bathrooms. A reflective tile is one that reflects. Quite suggestive isn’t it? These tiles are also known as mirror tiles as you can see your reflection on them. 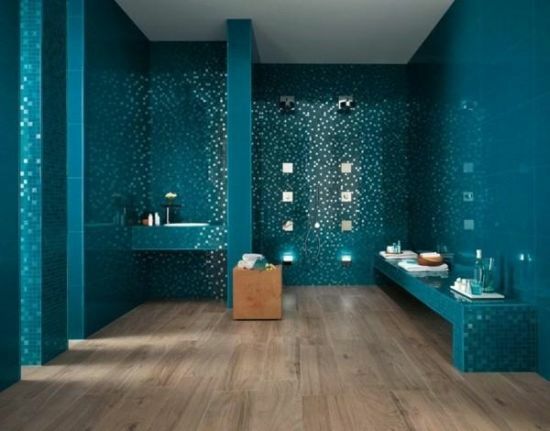 Apart from lending a spacious look, these tiles also do an instant makeover of your bathroom decor. It doesn’t matter if your mirror tiles used all over the bathing area are dark or light as these tiles look glamorous in all avatars, like in the images you can see below. 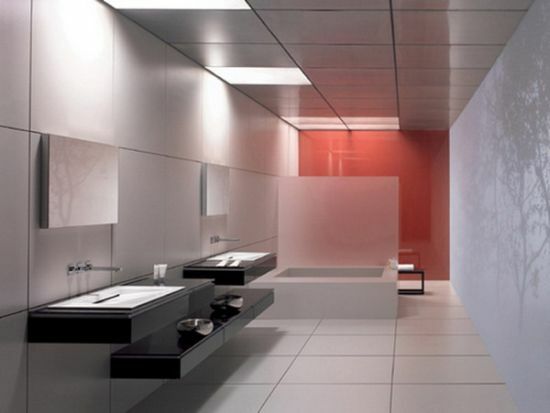 Here again, you can choose between frosted mirror tiles or gloss finished. The bathroom images here will show exactly how these will appear once you decorate them with reflective walls in colors like blue, aquamarine, pink as well as dark brown. The walls bear reflective chrome facades that help in bringing a perfect harmony inside, whereby you get to see a playful mix of reflections and light. 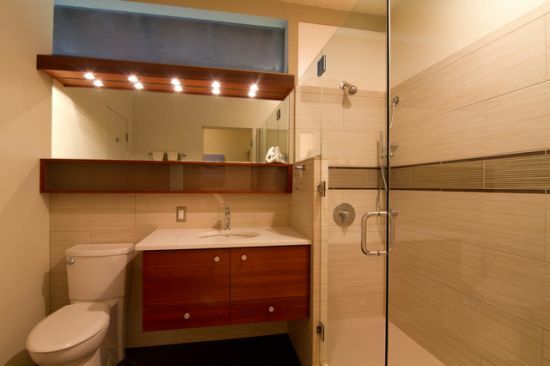 Modern bathroom remodel ideas that we have showcased below will enable you to renovate or remodel your small bathrooms in an efficient manner. A small bathing area lacks space and storage functions, and this is what makes architects and designers think of new and innovative ways to tackle the problem. 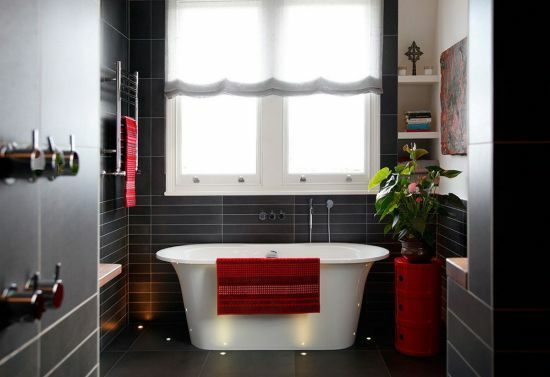 Small bathrooms needn’t be designed to look cramped up. Instead, these can transform themselves to look bigger with additions of new color schemes, paint options, compact furniture and minimal furnishings. 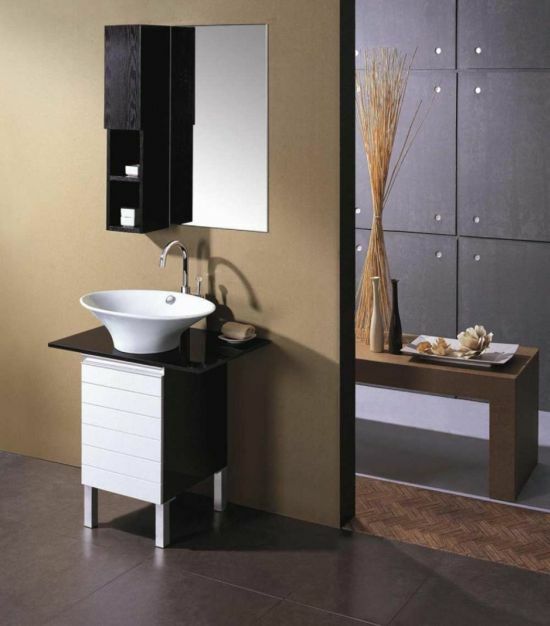 For a modern styled small bathroom, the furniture chosen has to be very sleek and functional. Cabinets play an important part for storing things, and must find place in your bathing area. Lighting too plays a pivotal role, and as such needs to be of good quality. 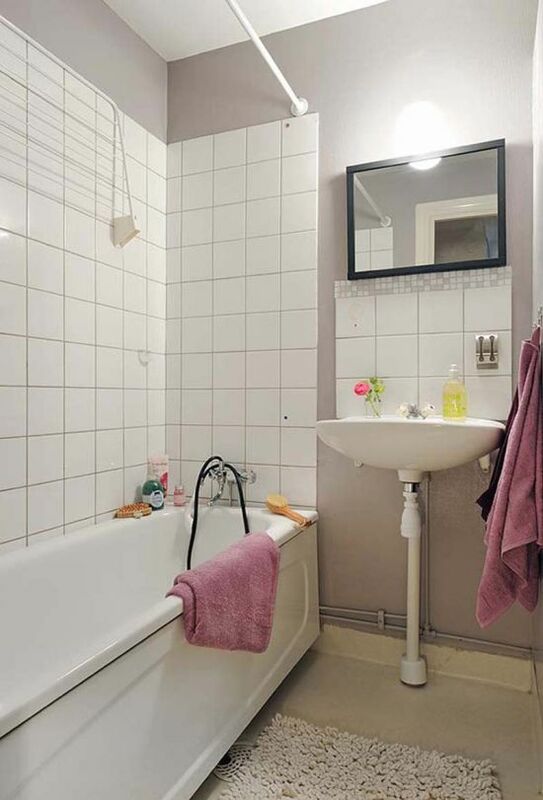 For more knowledge, just look down and see how glamorous these pictures of small bathrooms look. Some have smart and sleek furniture, while others have dual purpose accessories like sink and tub unit to offer more area inside. All these elements help in creating a stress free ambiance where you can relax and rejuvenate. 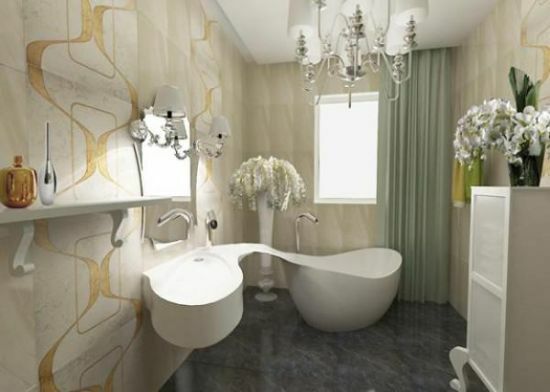 A modern styled bathroom can become the most glamorous part of your house provided it incorporates all the elements or ideas we just discussed above. When you think of redoing or remodeling your old bathroom, always consider balancing between color schemes, tiles, wall paints, furniture, and lighting, all of which must be included in your decor plan. All these elements are pivotal to acquiring a modern themed bathroom that looks spacious, and one cannot be achieved without the other. 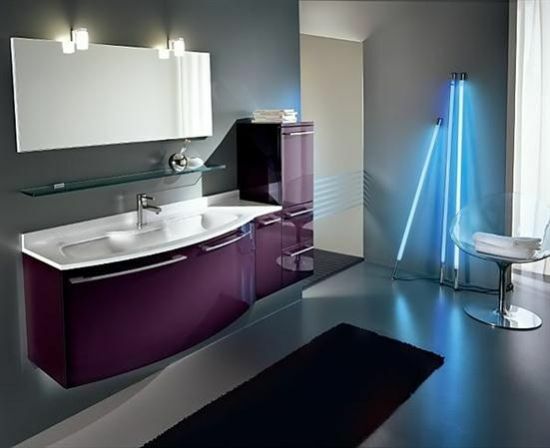 So, go ahead and take your time in reading this fabulous post that has listed some creative and stunning modern bathroom ideas.